My friend Jess is secretly crafty. I say this because it’s not what she’s passionate about. It’s not what she blogs about. Heck… it’s not even something she tweets about. 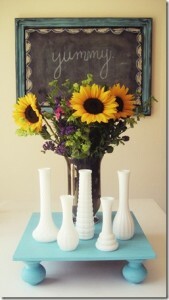 But go to her house and you’ll see a plethora of home decor craftiness! Jess and I have gone thrift store shopping together several times. She has a knack for buying something hideous and making it into something beautiful. I like to think I have that same talent… but I’m lazy and my trashy treasures pile up until my home looks like an episode of Hoarders. The picture in this post is a real picture taken in Jess’ home. I was with her when she bought the vases and the little table. It was a dusty, beat up, piece of wood and Jess made it look like it was in a magazine. Go ahead and hate her… then copy her style. She likes it. Every Monday, live at 10pm EST… I host my tutorial show Sew Krazy on MomTv. 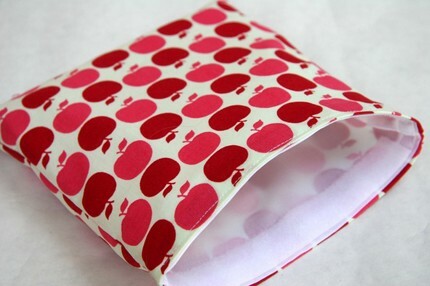 Join us this week as I teach the audience how to make lunch sacks and reusable sandwich bags! Once the fabric, stabilizer, and nylon are cut to size… layer the three pieces like a sandwich and pin. You should now have a front, back, bottom and two side pieces completed and pinned to hold it together. Begin by sewing the front and back pieces to the bottom piece WRONG sides together (meaning the RIGHT sides are facing out). This method leaves a raw edge but is a cute and quick way to finish your project. Next… sew the side pieces to the bottom. Finally… join the side pieces to the front and the back piece. Your velcro can be added to a comfortable closing spot and the handle added to the top of the flap! Tune in for a visual aid! 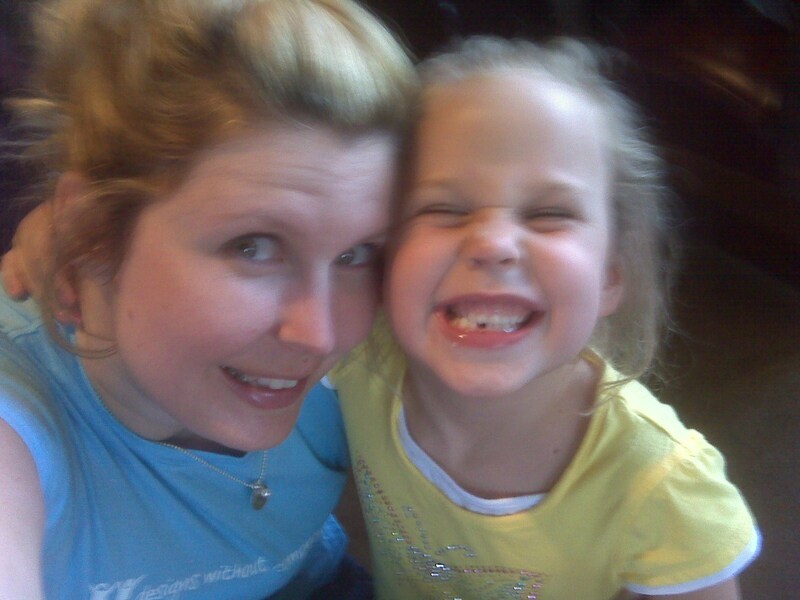 I look back and can’t believe it’s been six years since you were born. Continue to make that cheesy grin… it’s part of what makes you… you. Continue to draw, climb, giggle, and peel the crusts off your sandwiches. And as the years go by… continue to exceed my every expectation of you. This post is a day late… but better late than never right? I like to talk crafty snacks on Wednesdays. Today, I’m gonna talk about protein! Being the parent of a diabetic child that loves to snack has posed several problems along the way. She wants a snack and to her… snack meant peanut butter crackers or yogurt covered pretzels or even a small bowl of ice cream. 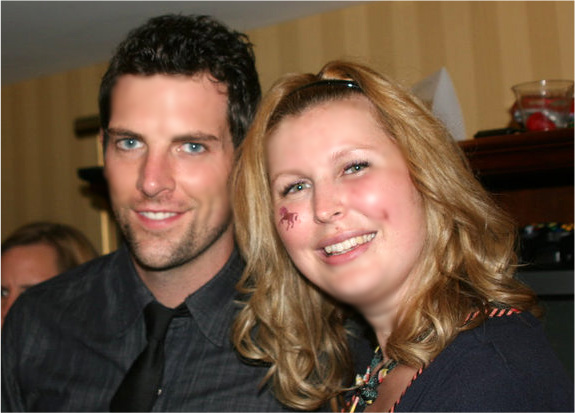 After her diagnosis… it was difficult to change the way she looked at snacks. Over time, we learned that protein is our new best friend. Typically, she can eat enough protein to fill her belly and I don’t have to worry about her carbs and sugars. We love string cheese, scrambled eggs, and rolled up lunch meat. 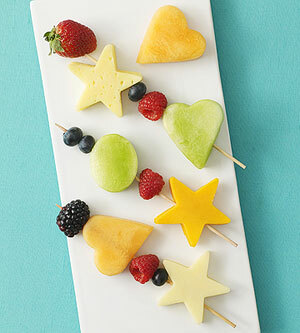 Today, we’re making fruit and cheese kabobs. These tasty and cute snacks pack a cheesy protein punch along with a healthy dose of fruity sugars. Simply cut a slice of cheese from the block that will be thick enough to keep it’s shape once you use the cookie cutters. You can also use the cookie cutters to shape melon slices. Slide your fruits and cheeses onto a kabob stick and serve! My job is to interview various brand reps and women enjoying the event for an hour on MomTV. How cool is that? I interviewed Vera Sweeny and we talked about eye liner. She has the most amazing eye liner technique. She was going to tell me how she did it… but wasn’t able to make it back. Next I spoke to a rep from Sketchers. She’s actually their fitness expert. She got to tell me all about the new Sketchers Shape Ups. I even got a pair for myself! How awesome is that? Sketchers Shape Ups help to tone and shape the booty and thighs as you walk around in them all day. Exercise couldn’t get any easier! They were so comfy too… I wore them all day when I was walking around New York on Saturday. After my Sketchers interview… I spoke with a rep from Miracle Body Jeans. These jeans make it look like you lost 10 pounds in 10 seconds! For reals! It has to do with the hidden tummy panel inside the jeans. I chose a dark wash, boot cut style. Let me tell you… I am in love. They have a bit of stretch and they make my booty look fierce! Besides that… a dark wash jean can go from day to night just by changing my top and accessories. It was a really great day on MomTv. It was a great day in general. Not only did I walk away with some amazing products… I met some fantastic people who are passionate about what they do. A big thanks to Vera and Audrey for putting on such a classy event. And thank you MomTV for sending me to cover it live. 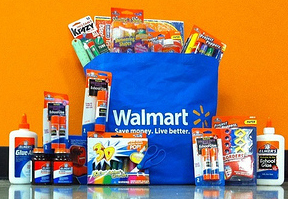 ﻿I’ve given to the Elmer’s Bag It Forward program… Have you? Be a part of Blog Hop ’10!